The aim of this study was to use apple peel extract (APE) as antioxidant for inhibition of lipid and protein oxidation in rainbow trout (Oncorhynchus mykiss) mince during refrigerated storage. Apple peel extract had high 2,2-diphenyl-1-picrylhydrazyl (DPPH), 2,2′-azinobios-(3-ethylbenzothiazoline-6-sulphonic acid) (ABTS) and hydroxyl radical scavenging activity and ferric reducing antioxidant power (FRAP) comparable to ascorbic acid. Lipid oxidation was effectively inhibited in mince during 96 h of refrigerated storage as indicated by significantly lower peroxides and thiobarbituric acid-reactive substances (TBARS) (P < 0.05) compared to control. APE could reduce protein oxidation as evidenced by lower protein carbonyls and higher total sulfhydryl group content (P < 0.05) compared to control. This was coincidental with higher polyunsaturated fatty acids (PUFA)/saturated fatty acids (SFA) and eicosapentaenoic acid (EPA) + docosahexaenoic acid (DHA)/palmitic acid (C16:0) ratio in mince with added apple peel extract, especially at 20 mg of gallic acid equivalent/kg mince. Apple peel extract retarded fish mince lipid and protein oxidation during refrigerated storage and might be considered as natural antioxidant in rainbow trout mince. Oxidation of lipids, proteins, and other compounds in muscle foods manifest in the form of undesirable off-flavor or rancidity, discoloration and the formation of potentially toxic compounds as well as peroxyl radicals linked to health risks in addition to the reduction of nutrients (Shahidi and Ambigaipalan 2015). As a result, synthetic antioxidants have been used to prevent food oxidation. Some of the synthetic antioxidants widely used in foods have been shown to attack macromolecules, leading to mutagenic, cancerous and cytotoxic effects (Dolatabadi and Kashanian 2010). Therefore, replacing them with some naturally occurring antioxidants from plants have been thought (Falowo et al. 2014; Shahidi and Ambigaipalan 2015). Phenolic extracts from green tea and rosemary (Namal Senanayake 2013; Pires et al. 2017), potato peel (Sabeena Farvin et al. 2012), apple peel (Sekhon-loodu et al. 2013), spices (Embuscado 2015), seaweed (Shitole et al. 2014; Rattaya et al. 2015) as well as pure phenolics have been found to possess antioxidant activity, thereby preventing oxidative deterioration of foods (Maqsood and Benjakul 2010; Namal Senanayake SPJ 2013; Takeungwongtrakul and Benjakul 2013). Apple peel, a by-product of apple processing, has previously been shown to possess diverse biological properties, making it suitable as a functional ingredient (Wolfe and Liu 2003). Flavanols, hydroxycinnamates, dihydrochalcones, flavonols, and anthocyanins are the main polyphenolic compounds in apple peel (Tsao et al. 2003; Raudone et al. 2017), contributing to its strong bioactivities such antihypertensive, antioxidant, anti-inflammatory activities (Balasuriya and Rupasinghe 2012; Denis et al. 2013). Quercetin-3-O-glycosides-, phloridzin-, cyanidin-3-O-galactoside-, epicatechin- and chlorogenic acid-rich fractions from apple peel contributed significantly to inhibit oxidation of fish oil (Sekhon-loodu et al. 2013); while, individual phenolic from apple peel inhibited myofibrillar protein carbonylation induced by free radicals (Utrera and Estévez 2013). Fish mince is generally prone to lipid and protein oxidation due to its high external surface and high content of polyunsaturated fatty acid (PUFA), iron, hemoglobin (Hb) and other muscle components involved in the oxidative reactions. 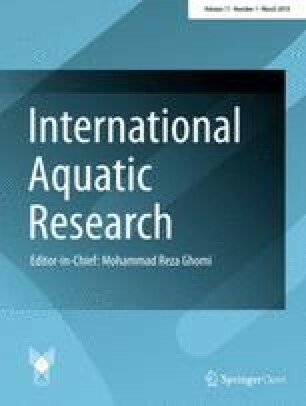 Hemoglobin is a major contributor to lipid oxidation in fish or their products, associated with deteriorated flavor, color, texture and nutritional value (Maqsood et al. 2012). Rainbow trout (Oncorhynchus mykiss) is a widely aquacultured fish. The use of rainbow trout flesh in formulation of different minced-based products is increasing. Since blood is not generally removed, short-time refrigerated storage of farmed rainbow trout mince is a challenge with regards to lipid and protein oxidation. The objective of this work was to evaluate the potency of apple peel extract as natural antioxidant for inhibition of lipid and protein oxidation in farmed rainbow trout mince during refrigerated storage. Gallic acid (GA), Folin–Ciocalteu reagent, 6-hydroxy-2,5,7,8-tetramethylchroman-2-carboxylic acid (trolox), 5,5-Dithiobis(2-nitrobenzoic acid) (DTNB) 2,4-Dinitrophenylhydrazine (DNPH) and cumene hydroperoxide were purchased from Sigma-Aldrich Chemical Co. (St. Louis, MO, USA). An ultrasound-assisted extraction procedure was used for the preparation of apple peel extract (Chandrasekara and Shahidi 2011). Apple peel was first removed manually and immediately boiled for 30 s to inactivate polyphenol oxidase activity as per the method of Sekhon-loodu et al. (2013). The boiled peels were then dried at 60 °C for 8 h in an oven (Binder, Hotline International, USA), and then ground using 1-mm sieve size to obtain powder. Ten grams of powdered apple peel was extracted using 100 mL of distilled water at room temperature in an ultrasonic bath (Precision Ultrasonic Cleaning, Ultrawave Limited Co., Cardiff, UK) and sonicated at the maximum power (50–60 HZ) for 20 min. The sonication was repeated for two more times and centrifuged for 10 min at 4 °C (10,000×g). The obtained supernatants were collected in a 50-mL falcon tubes and stored at − 18 °C. Total phenolic compound of the apple peel extract was measured by reacting 20 µL of the apple peel extract, diluted in 1.16 mL of deionized water, with 0.1-mL Folin–Ciocalteu reagent before incubation at room temperature for 8 min in dark. After adding 300 µL of 20% sodium acetate, the solution was heated at 60 °C for 0.5 h. Absorbance was read at 760 nm (CamSpec M330, Cambridge). Gallic acid (GA) at 50–800 ppm was used to quantify total phenolic compound as µg of gallic acid equivalent (Sekhon-loodu et al. 2013). DPPH radical scavenging activity was tested as described by Tongnuanchan et al. (2014). Apple peel extract (1–20 µg gallic acid equivalent/mL) was reacted by radical solution (0.1 mM) that was prepared in 95% ethanol. This was followed by mixing well and incubating in the dark condition for 0.5 h. Finally, the absorbance of solutions was read at 517 nm and compared with the blank solution that used water instead of extract. Antioxidant activity was measured as follows: A517 of control – A517 of sample -/A517 of control × 100. IC50 was calculated as the extract concentration against the percent scavenging activity. ABTS•+ scavenging activity was determined according to Karnjanapratum and Benjakul (2015). To generate ABTS radicals, ABTS (7.4 mM) and potassium persulfate (2.6 mM) were mixed with each other (1:1 v/v) and allowed to react overnight (12 h) until a dark greenish color of the solution was obtained. The absorbance of the ABTS solution was adjusted to 1.100 by methanol with the aid of a UV spectrophotometer (734 nm). One-hundred microliter of apple peel extract (10–500 µg gallic acid equivalent/mL) was mixed with 2850 µL of the freshly prepared ABTS solution and allowed to react at dark for 2 h. The ABTS radical scavenging activity was calculated, following recording the absorbance at 734 nm, as follows: A734 of control – A734 of sample -/A734 of control × 100. IC50 was calculated as the extract concentration against the percent scavenging activity. To measure scavenging activity against hydroxyl radicals, the fresh 1,10-phenanthroline solution (1.0 mL, 1.865 mM) and 200 µL of apple peel extract (2–100 µg gallic acid equivalent/mL) were first reacted in a test tube followed by addition of 1 mL of 1.865 mM FeSO4 solution. To initiate reaction, hydrogen peroxide (0.03%, v/v, 1 mL) was added to the reactive mixture. After being incubated at 37 °C for 1 h, the absorbance of the samples (536 nm) was read and compared with the negative control (without extract) and blank (without H2O2). The antioxidant activity (%) was determined using the below equation: [(As−An)/(Ab−An)] × 100, where As, An, and Ab were the absorbance of the sample, the negative control, and the blank, respectively. FRAP of apple peel extract was measured (Benzie and Strain, 1996). The reaction solution was prepared freshly by dissolving 10-mM TPTZ (in 40-mM HCl), 20-mM ferric chloride, in 300-mM acetate buffer (pH 3.6) at the ratio of 5:5:25 (v/v). This solution was stored at 37 °C for 0.5 h. FRAP reagent (2850 µL) was mixed with 0.15 mL of extract (1–10 µg gallic acid equivalent/mL). Samples were kept in dark for 0.5 h. The absorbance was read at 539 nm and FRAP was expressed as µM trolox equivalent. Alive rainbow trout was purchased from a local fish store (Urmia, Iran). In the store, the fish were kept as alive in a glass tank (2 × 1 × 1 m) with aeration. The water temperature in the tank was ~ 12 °C. After killing fish with a rapid blow on the head, the fish were eviscerated and beheaded. The fish were placed in ice with a fish/ice ratio of 1:2 (w/w) and transported to the laboratory, where they arrived about 0.5 h. Before mincing, the fish were fileted and skin, red muscle and belly flaps were removed. Filets were then minced using a meat blender equipped with a 3-mm plate (Pars Khazar Co., Iran). Mince was divided into equal portions; each portion was ~ 250 g. Each mince portion again was divided into 3 smaller portions (~ 80 g each; represent one replicate) to which apple peel extract was added as aqueous form at different concentrations (10, 20, 30, 50, and 100 mg of gallic acid equivalent/kg mince) or ascorbic acid (100 mg/kg mince). Mince without the addition of apple peel extract was used as the control. After addition of apple peel extract or ascorbic acid, each mince portion was mixed well with the aid of a small fork well to ensure the even distribution of apple peel extract and then placed in plastic bags and covered using aluminum foil. All mince samples were stored at 4 °C for 96 h. At each time interval (0, 24, 48 and 96 days), samples were taken for quality analyses. Peroxide value was determined using the method of Richards and Hultin (2002). Absorbance of the reaction solution prepared by the method of Shantha and Decker (1994) was measured at 500 nm (UV/Visible spectrophotometer, CamSpec M330, Cambridge). Cumene hydroperoxide (0–20 μmol kg−1) was used as a standard for determination of PV (μmol hydroperoxide kg−1 sample). Thiobarbituric acid-reactive substances (TBARS) were determined using the method described by Nilsuwan et al. (2016) and were expressed as mg malonaldehyde (MDA) equivalents kg−1 sample. Protein carbonyls were determined as described by Levine et al. (1994). Five-hundred mg of mince was mixed with 20 volumes of extraction buffer (50 mM Tris, 1 mM EDTA, pH 7.4) containing 0.1 g/L butylated hydroxytoluene (BHT) and blended well using a homogenizer. Five-hundred microliters of 30% TCA was used to precipitate the 300 μL of the homogenate. The protein pellet was obtained after centrifugation at 12,000g (3 min, 4 °C) and then mixed with 10 mM 2,4- dinitrophenylhydrazine (DNPH) in 2 mol/L hydrochloric acid (1 h). Sample containing only 2 mol/L hydrochloric acid without DNPH was prepared as blank. Second precipitation step was performed as above by 30% TCA and the solids were washed 3 times with 1 mL of ethanol/ethyl acetate (1:1, v/v) containing 10 mmol/L hydrochloric acid to remove free DNPH. The solid parts were dissolved in 1 mL of 6-M guanidine chloride prepared in 20 mol/L potassium dihydrogen phosphate (pH 2.3) and left for 12 h at 4 °C. The carbonyl content was calculated by measuring the absorbance at 370 and 280 nm. Results were expressed in nmoles carbonyl per mg of soluble protein using a molar extinction coefficient of 22,000 M−1cm−1. The content of sulfhydryl groups was measured using DTNB (Ellman, 1959). Five-hundred mg of mince was mixed with 20 volumes of extraction buffer A (PBS 0.05 M, pH 7.2) and homogenized for 30 s. One-thousand microliter of the supernatant was added with 9 mL of the same buffer (PBS 0.05 M, pH 7.2) containing 0.6 M NaCl, 6 mM EDTA, and 8 M urea (Buffer B), vortexed for 10 s and centrifuged at 14,000×g for 15 min at 4 °C. Three mL of the clear solution was mixed with 40 µL of 0.01 M DTNB prepared in 0.05-M sodium acetate. All peptide samples were stored at 40 °C for 15 min. Sample containing the second extraction buffer B instead of mince was considered as blank. A molar extinction coefficient of 13,600 M−1cm−1 was used to calculate total SH (µmol/g) after measuring absorbance at 412 nm. Fatty acid profile was measured using gas chromatography (GC) (Agilent technologies 7890A, USA) coupled with a 30-m × 0.25-mm DB225MS column according to the method of Miquel and Browse (1992). Hexane–fatty acid methyl ester (FAME) fraction (1 µL) was separated by GC from an initial temperature of 100 °C up to 220 °C and quantified using a flame ionization detector. The content of each fatty acid was expressed as mg/g FAME. Data were subjected to one-way ANOVA (SPSS 16.0; SPSS Inc, IL, USA) and differences among means were compared by Duncan’s multiple range test at P < 0.05. All data were expressed as M ± SD (n = 3). In this study, the DPPH·, ABTS·+, and OH· scavenging activities and the FRAP of the apple peel extract were determined. The results indicated that apple peel extract had the ability to scavenge DPPH·, ABTS·+, and OH· in a concentration-dependent manner. Hydroxyl radicals as extremely reactive oxygen species are assumed to promote the oxidation of lipids through a free radical chain reaction (Shahidi and Ambigaipalan 2015). At the concentration of 50 µg/mL, the OH· scavenging activity was 57%. With further increasing concentration up to 100 µg/mL, antioxidant activity was significantly (P < 0.05) increased and almost all radicals were scavenged (Fig. 1). The IC50 value in scavenging OH· was 42.3 µg/mL which was higher than that of ascorbic acid (803.34 µg/mL). Apple peel extract had high potency in scavenging DPPH·. At only 2 µg/mL, scavenging activity was more than 20% and increased to 53% at 6 µg/mL. After this concentration and up to 10 µg/mL, significant differences (P > 0.05) in antioxidant activity were not observed. The IC50 of peel extract in scavenging DPPH· was 5.57 µg/mL. DPPH· are molecules that possesses a proton-free radical with a characteristic absorption, which decreases significantly upon exposure to proton radical scavengers (Chandrasekara and Shahidi 2011). Sekhon-Loodu et al. (2013) demonstrated that fractions, mainly rich in flavonols, from apple peel were able to act as antioxidant by donating a hydrogen or an electron to DPPH·, thereby converting them into more stable radicals. About 92.91% of ABTS·+ was scavenged when peel extract at 200 µg/mL was used. The results showed high ABTS·+ scavenging activity of apple peel extract with IC50 of 48.14 µg/mL. The FRAP of apple peel extract and ascorbic acid at 10 µg gallic acid equivalent/mL was 76 and 82 µM trolox equivalent, respectively. Some studies in vitro or in model systems indicated that apple peel extract played as powerful natural antioxidants which were comparable or even better than synthetic antioxidants (Lotito and Frei 2004; Sekhon-Loodu et al. 2013). A work done by Rupasinghe et al. (2008) indicated that apple peel extract stabilized peroxyl radical-induced oxidation of methyl linolenate and it was strongly correlated with the concentration of epicatechin in the extract. Additionally, Sekhon-Loodu et al. (2013) prepared phenolic fractions from dried or frozen apple peel using specific separating resin and further confirmed high antioxidant activity for fractions and crude extract. Previous studies have reported that high antioxidant activity of apple peel extract was associated with the content of flavonols, phenolic acids, dihydrochalcones, anthocyanins and flavan-3-ols (Rupasinghe et al. 2010). Apple peel extract scavenged DPPH·, ABTS·+, and OH·, which may explain partly their antioxidant activity in mince. The effect of apple peel extract on lipid oxidation in fish mince during storage at 4 ± 1 °C was determined (Fig. 2a). Peroxide of mince samples increased throughout the storage (P < 0.05). But, the extent of PV formation was significantly higher in the control samples (P < 0.05). After 4 days of refrigerated storage, the content of peroxide in the control samples was 11.95 µmol hydroperoxide/kg. In contrast, mince samples containing apple peel extract had significantly lower PV (P < 0.05). Mince with 20-mg gallic acid equivalent/kg showed higher stability against oxidation as evidenced by low PV during the storage period. After 4 days, the content of PV in 20-mg gallic acid equivalent/kg was 3.29 µmol hydroperoxide/kg (P < 0.05). However, no difference in PV between 50 and 100 mg gallic acid equivalent/kg treatments was noticeable (P > 0.05). PV of control was similar to that of 100-mg gallic acid equivalent/kg treatment (P > 0.05). On the other hand, in the control sample, TBARS increased significantly from 0.7-mg MDA equivalent/kg at day 0 to 3.07 mg MDA equivalent/kg at day 4 (P < 0.05) (Fig. 2b). 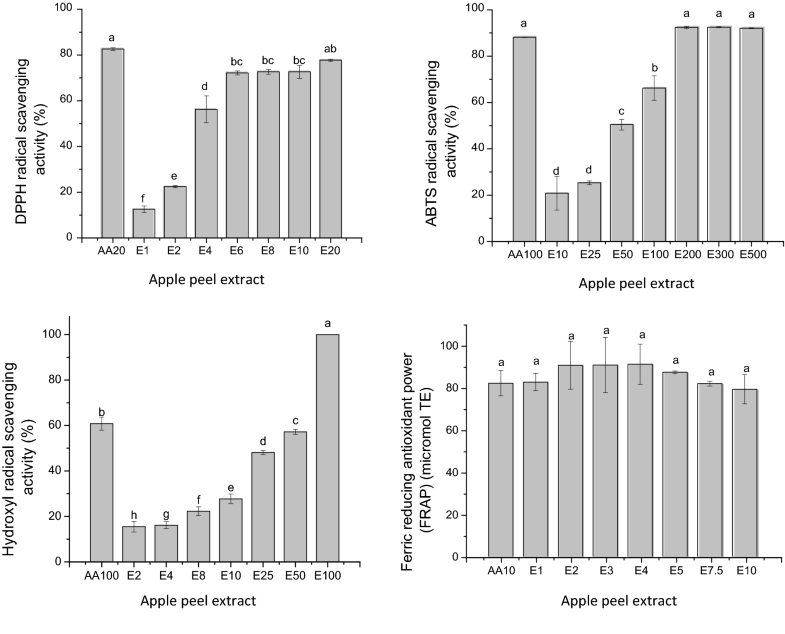 Apple peel extract strongly reduced TBARS (P < 0.05). 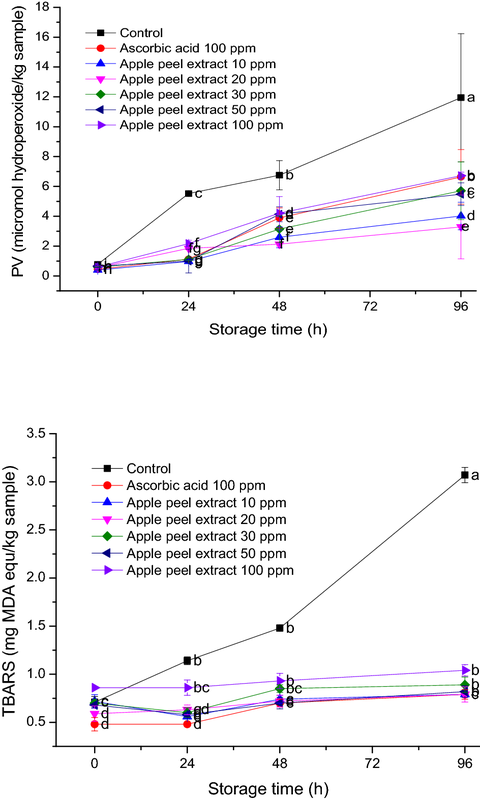 Minces containing apple peel extract at all concentrations showed lower TBARS throughout the refrigerated storage (0.77–1.04 mg MDA equivalent/kg after 4 days of storage). The inhibition of lipid oxidation by apple peel extract especially at 10 or 20 mg gallic acid equivalent/kg mince was comparable to that of mince containing 100 mg/kg ascorbic acid (P > 0.05). The reduction of TBARS by apple peel extract or polyphenolic fractions was also noted by Sekhon-Loodu et al. (2013) and Rupasinghe et al. (2010) and assumed to be due to free radical scavenging activity. Additionally, apple peel extract or anthocyanidins from the peel extract prevented peroxidation of linoleic acid (Vanzani et al. 2005). Shin et al. (2017) found that coating solution containing apple peel powder reduced lipid oxidation in beef patties. The presence of hydroxyl groups on the aromatic rings of phenolic compounds are associated with their antioxidant activity through donating electrons and neutralize free lipid radicals generated during the initial stage of oxidation (Medina et al. 2007; Nikoo et al. 2018). This further inhibits their degradation to more active oxidizing agents, such as MDA (Radha Krishnan et al. 2013) that may explain the inhibition of lipid oxidation. Water extract of apple peel showed potent radical scavenging activity and prevented lipid oxidation, thereby lowering rancidity in refrigerated fish mince. Protein carbonylation is one of the main deteriorative processes seen in oxidized fish muscle. In refrigerated stored or processed fish, myofibrillar proteins are oxidized, leading to the formation of carbonyl derivatives from some amino acids (Estevez 2011; Nikoo et al. 2016). The initial carbonyl content of mince was between 2.48 and 2.65 nmol/mg protein (P > 0.05) (Table 1). After refrigerated storage, the content of carbonyls increased, with control having the highest value (3.62 nmol/mg protein) on day 4 (P < 0.05). Addition of extract significantly reduced the oxidation of protein, evidenced by lower carbonyls (P < 0.05). No differences in protein carbonyls among samples treated with synthetic antioxidant, 10- or 20-mg gallic acid equivalent/kg mince apple peel extract were observed after 4 days of refrigerated storage (P > 0.05). Mince with 100-mg gallic acid equivalent/kg mince showed the lowest carbonyl content (2.50 nmol/mg protein) (P < 0.05) lower than that of the control samples and other treatments. Oxidation of protein and protein carbonylation are often associated with altered protein functionality, resulting in deteriorated texture, flavor, water holding capacity, and nutritional quality (Lund et al. 2011). With regards to protein carbonylation, a recent study indicated that apple peel phenolics chlorogenic acid, (-)-epicatechin and phloridzin inhibited the formation of specific protein carbonyl products in oxidized pork myofibrillar proteins, suggesting their role as natural inhibitor of protein carbonylation (Rysman et al. 2016). Additionally, quercetin, a flavonol from apple peel, showed potent antioxidant activity against protein oxidation, mainly due to its radical scavenging activity derived from the 3′,4′-dihydroxy group located on the B ring (Utrera and Estévez 2013). Because lipid oxidation products (free radicals, hydroperoxides and aldehyde) are also important in inducing protein oxidation (Davis and Dean 1997), the potent radical scavenging activity and chelating ability of peel extract would be important in lowering protein oxidation in mince. Sulfhydryl (SH) groups as the most reactive functional groups in myofibrillar proteins can be easily oxidized during refrigerated storage, frozen storage or temperature abuse, resulting in the formation of inter- and intra-molecular cross-linking or disulfide bonds (Benjakul and Visessanguan 2011). This is coincidental with a decrease in the content of surface or total SH (Lund et al. 2008). As a result, the oxidation of SH groups located in the head region of myosin can be considered as an indicator of protein oxidation. The initial content of SH group (day 0) was between 41.88 and 42.70 µmol/g mince (P > 0.05). After 4 days of refrigerated storage, SH group content decreased (P < 0.05) to 39.49 µmol/g mince in the control samples, corresponding to 8% of the initial value. In the APE-treated minces, SH group content ranged from 41.11 to 43.09 µmol/g mince after 4 days of storage. The content of SH group in APE-treated minces (10–100-mg gallic acid equivalent/kg mince) was significantly higher (P < 0.05) than in the control sample. Myofibrillar proteins are particularly susceptible to oxidation induced by free radicals. Hydroxyl radicals destabilized subfragment-1 (S-1) globular head of myosin, the most abundant myofibrillar component, in oxidized myofibrils (Ooizumi and Xiong 2006). Park et al. (2007) reported on the loss in sulfhydryl group content in oxidized myofibrillar proteins. SH groups of myofibrillar proteins in the control mince were probably more susceptible to oxidation during refrigerated storage. APE showed protection against oxidation of SH group in refrigerated trout mince, and thus, it is considered as a potential natural antioxidant. Palmitic acid (C16.0), oleic acid (C18:1n9), docosahexaenoic acid (C22:6n3), and linoleic acid (C18:2n6) were the dominant fatty acids in rainbow trout mince (Table 2). Among FA categories, polyunsaturated fatty acids (PUFA) were the main fatty acids followed by saturated fatty acids (SFA) = monounsaturated fatty acids (MUFA) in most samples. The highest EPA (1.84 mg/g FAME) and DHA (19.43 mg/g FAME) was observed in mince added with 20-mg gallic acid equivalent/kg mince after 4 days of storage followed by minces with added ascorbic acid or 10 mg gallic acid equivalent/kg mince. The higher content of SFA was observed in the control sample when compared with minces incorporated with synthetic antioxidant or peel extract, especially at lower concentrations. This might be due to higher oxidation of PUFA in the control, resulting in higher SFA in consistent with its lower PUFA (42.01 mg/g FAME) compared to samples added with 20-mg gallic acid equivalent/kg mince (47.83 mg/g FAME) or 100 mg/kg ascorbic acid (46.35 mg/g FAME). The n-3/n-6 ratio was between 0.65 and 1.04, being highest in 20-mg gallic acid equivalent/kg treatment. PUFA/SFA ratio was between 1.69 and 2.00, and mince incorporated with 20-mg gallic acid equivalent/kg mince apple peel extract showed the higher ratio compared to other treatments. The level of 20-mg gallic acid equivalent/kg mince might be useful in maintaining the higher levels of polyunsaturated fatty acids in refrigerated rainbow trout mince. Apple peel extract showed high antioxidant activity and effectively retarded lipid oxidation in refrigerated rainbow trout mince. It prevented protein oxidation as seen by lower protein carbonyls formed and higher total sulfhydryl group content compared to control. These results suggested that apple peel extract might be considered as a potential natural antioxidant in refrigerated farmed rainbow trout mince.